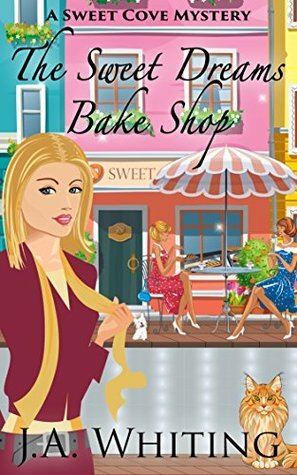 Angie Roseland runs The Sweet Dreams Bake Shop in the seacoast town of Sweet Cove, Massachusetts. The building's new owners are not renewing the bake shop's lease and Angie is running out of time to find a new location. When one of the town's long-time residents is murdered, Angie finds herself on the suspect list. With the help of her three sisters and a huge orange cat, Angie works to uncover the killer's identity. Angie Roseland runs The Sweet Dreams Bake Shop in the seacoast town of Sweet Cove, Massachusetts. The building’s new owners are not renewing the bake shop’s lease and Angie is running out of time to find a new location. When one of the town’s long-time residents is murdered, Angie finds herself on the suspect list. With the help of her three sisters and a huge orange cat, Angie works to uncover the killer’s identity. A cozy mystery with recipes and mild paranormal elements. The main mystery is solved in each book but you will enjoy the series more if the books are read in order as some story threads run from book to book.